Tah-gah-jute, the second son of Shikellamy (a very important figure in the Iroquois Confederation), was born in approximately 1725. While a young man, his father renamed him James Logan after James Logan, Secretary of the Provincial Council of Pennsylvania, for whom he had high regard. His mother and first wife were Cayuga. His first wife died in 1747 and he later married a Shawnee woman who bore him no children. 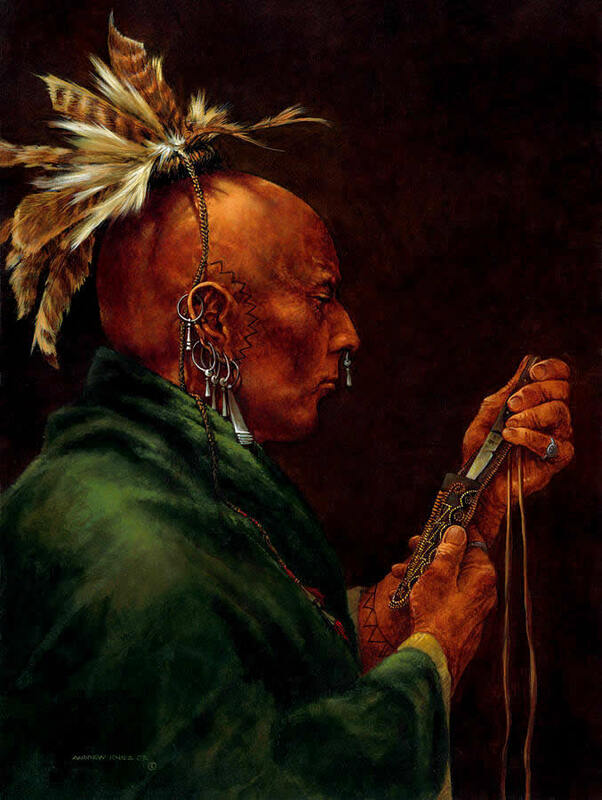 Logan, like his father went out of his way to cultivate friendship with the white traders, settlers and military personnel who were continually moving west into Indian territory. He and his family moved frequently and in 1774 they were living on the Ohio River at the mouth of Yellow Creek. Logan was away on a hunting trip when two of the men of his camp were killed, allegedly for being horse thieves. It is believed that Logan’s men planned a retaliatory attack against the whites who were under the command of Daniel Greathouse. Greathouse invited Logan’s friends and family across the river to be his guests at Baker’s Tavern the next day. When they arrived, they were freely treated with rum. Soon the Indians were challenged to shoot at a mark. The Indians fired first and when their guns were emptied, the whites, with additional help from men hidden in a backroom of the tavern, slaughtered all of Logan’s friends and family, except for his sister’s two month old infant who was spared and eventually adopted and raised by Colonel William Crawford. When Logan learned of the tragedy, he swore vengeance. Leading a small group of warriors, Logan who mistakenly believed that captain Michael Cresap was responsible for the death of his family, devastated the frontier, taking at least thirty scalps and prisoners. On July 21, 1774, he dictated a letter to William Robinson, a prisoner. The letter to Cresap was written with gunpowder mixed in water: “To Captain Cresap: What did you kill my people on Yellow Creek for? The White People killed my kin at Conestoga a great while ago and I thought nothing of that; but you killed my kin again on Yellow Creek and took my cousin prisoner. Then I thought I must kill too; and I have been three times to war since; but the Indians are not angry, only myself.” Logan continued on the warpath until October and then “sat still”, refusing to fight any longer. The recent Battle of Point Pleasant had convinced the Indians that their only hope of survival was to reach a peaceful agreement with Lord Dunmore. Logan refused to attend that conference. Lord Dunmore sent John Gibson, the father of the infant that survived the massacre, to try to convince Logan to attend the meeting. Logan again refused, but dictated to Gibson the famous “Logan’s Lament”, under an elm tree which stood until 1964, six miles south of Circleville, Ohio: “I appeal to any white man to say if ever he entered Logan’s cabin hungry, and I gave him not meat; if ever he came cold or naked, and I gave him not clothing. “During the course of the last long and bloody war, Logan remained in his tent, an advocate for peace. Nay, such was my love for the whites, that those of my own country pointed at me as they passed, and said, “Logan is the friend of white men.” I had even thought to live with you, but for the injuries of one man, Colonel Cresap the last spring, in cold blood, and unprovoked, cut off all the relatives of Logan; not sparing even my women and children. There runs not a drop of my blood in the veins of any human creature. This called on me for revenge. I have sought it. I have killed many. I have fully glutted my vengeance. For my country, I rejoice at the beams of peace. Yet, do not harbor the thought that mine is the joy of fear. Logan never felt fear. He will not turn on his heel to save his life. Who is there to mourn for Logan? Not one.” By 1781 Thomas Jefferson had received and published “Logan’s Lament” and it received worldwide publicity. After the treaty signing with Lord Dunmore, Logan wandered about, mostly throughout the state of Ohio. Again, he was instrumental in saving the lives of white prisoners including famed frontiersman Simon Kenton. By 1780 he had taken another wife and during a Council of Chiefs in Detroit, while crazed by drink, he struck his wife a terrible blow and almost killed her. He left the scene and headed for home through the forest. Controversy surrounds the exact circumstances of his death, but most historians agree that he was killed on the way home by either his wife’s relatives or by Tod-kah-dohs, the nephew who survived the Greathouse massacre, for that transgression. The painting entitled “Remembering” depicts Chief Logan, as he sits looking at the last vestige of work made by the loving hands of his family, now gone forever, his mind forming the words that became “Logan’s Lament”. His faith in peace shattered with vengeance, fully vented, and now finding he is empty and alone.